According to an Australian Product Alert that was just sent out, Australia will soon be seeing a Lolo and Ivory No Limit Tank. Hopefully North America will get this one soon too. 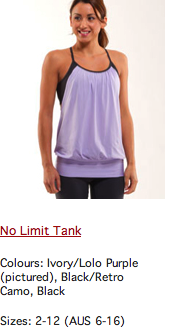 I’m not too fond of the No Limit Tank and how it looks on me but this color combo sounds lovely. "New Spring Run Gear is Here!! Run: Chase Me Skirt and Run: Chase Me Crops"
If this comes to Canada, how long do you think it would take?